Ryan Cresswell insists the ongoing uncertainty surrounding the proposed takeover of the Cobblers by an unnamed consortium is not affecting the players. It is now more than eight weeks since chairman David Cardoza announced an Indian-led consortium was buying the club, but the deal has yet to be finalised. There was a protest from supporters at last weekend’s clash with Oxford United, with fans frustrated at the lack of progress, and lack of information on what is happening behind the scenes at the club. Cresswell was aware of last week’s protest, and understands the supporters’ concerns, but he says the players are just getting on with their jobs. “All we can affect is what happens on a match day,” said the central defender. “We don’t get involved in anything the club is involved in, we come in we work, we go home. Far from being a distraction last weekend, the protest seemed to galvanise the home fans into offering added support for their team. 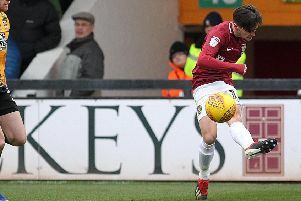 Cresswell felt the atmosphere inside Sixfields, particularly after Jason Taylor’s sending-off, was as good as he has experienced. Asked if the protest might have even brought the fans and players closer together, the Yorkshireman said: “Maybe it has. “The fans really got behind the team and the management on Saturday, and it worked. Long may that continue. “Everybody had to be involved in that win on Saturday, especially after we went down to 10 men. “We needed the crowd behind us and I think we came out second half, and they were there for us. You could hear the songs ringing around, and it really rallied the team. It gave us an extra gear and it saw us over the line. “When that happens, and it’s everybody together like it was, then Sixfields can be a fortress. The atmosphere this weekend will be a bit different as the Cobblers travel to Morecambe on Saturday, the club with the lowest average attendance in Sky Bet League Two. It is going to be a different kind of test for Cresswell and his Cobblers team-mates, and he is wary of one of the Shrimpers players in particular - his former Rotherham United team-mate Kevin Ellison. Ellison is one of those players all opposing fans love to hate, is capable of starting a fight in a phone box, but he also a very good player. “I played with Kev for a couple of years at Rotherham, and he is a character,” admitted Cresswell. “He plays the pantomime villain and he gets the crowd going, which helps the team he’s playing for. “He is a good lad, he has scored goals for Morecambe and everywhere else he has been, and that is why he is still playing at his age. “Another thing he does is that he works his socks off and gives it everything for his football club.